On November 3rd, 1998 Adam sat with his girlfriend of a few weeks, Jessica, at the Brian Setzer Orchestra Concert. While watching the opening band he noticed the rest of the audience was bored out of their minds, and thought of how hard it was to be the opening band. What would he do differently if he were in their position? "I pictured walking onstage with a flatscreen TV with me on it, talking and singing. It would grab their attention visually and audibly. Seemed impossible of course because at the time the those TVs cost about $15,000, and to really sing a song you'd really need about four TVs..."
"...and that was the moment. I'm not sure how I stayed in my seat. I kept saying "Oh My God" to Jessica. I wanted to explain it, but the weight of the idea just kept making me say "Oh My God" over and over. I eventually let her in on it, and the following week I had figured out how to techincally do it. Obsessed with pulling it off, I bought 4 TVs that I couldn't afford simply to make sure the idea didn't slip away." Over the next several months he wrote and filmed the first 4 sets and performed his first show (and actually turned on those 4 TVs for the first time) on May 7th, 1999. Over the course of the year he filmed 15 sets and performed 25 shows. Bars booked 4TVs like any band and Adam made a fairly good dent in the Columbus music scene. 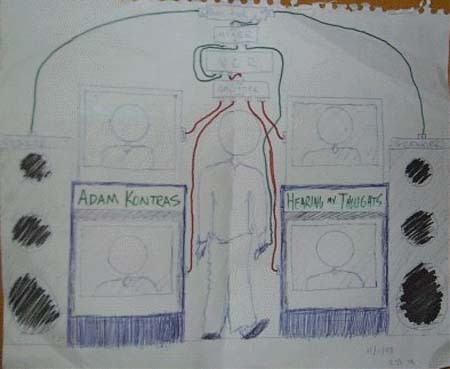 It wasn't long before Adam was ready to take 4TVs to the next level, and on January 1st, 2000, he spent the day saying goodbye to his family and made the move to LA. 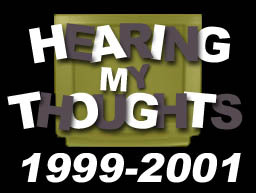 Adam continued to perform "Hearing My Thoughts" until February 21st, 2001 at which point work on a new one-man show took over. Be sure to check out the videos of all 16 sets.